From where I was standing to capture the moments of the Sydney opera house, there stands the glamorous Sydney harbour bridge. I was getting excited when it gets darker and the lights turned on, the bridge turned into a beautiful nightscape for me right after I am done with photographing the opera house! With the fading dark blue sky behind, it provides a clean background for my capture of the bridge. Again, I took long exposure on my tripod with 16-35mm f2.8 L on 5D II. I have only adjusted the brightness of the whole picture a little to show a bit more of the sky using photoshop. I knew how other tourists took their photos of the opera house as their foreground and the harbour bridge as part of the background. In my own opinion, I do not wish to have such complicated photos with so many objects in as I am not really comfortable with the compositions like that. While I was clicking on my shutter release on the bridge, I realized how beautiful the moon is just across the water on my left where the Park Hyatt hotel stands. It was really mesmerizing for me! Therefore, I composed again another shot on another nightscape to share here. I was really satisfied with my works and after few shots, I packed up and go as it was really dark at that time. Moreover, it was getting colder, I can’t really stand cold temperature and I made my way back to my car and drove back to my hotel to have my early night rest. Sydney Park Hyatt hotel nightscape with the gorgeous crescent moon. Thanks! I was very lucky to be there that day with very nice lights and fairly good weather! Thank you! I love the lights too! yeah I love it too 🙂 Great travels by the way! I love traveling! I’m sure you too! You will! And you will definitely love it a lot! Oh wow! Nice to know someone who lived in Sydney before! Cheers! a strong message! it looks like “the perfect place to visit”! cheers. Exactly! A very nice place indeed! love, love, LOVE Sydney!!! your pics bring back fond memories, Alex. 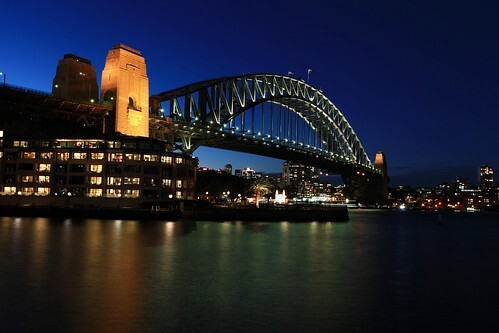 That second shot of Circular Quay at night is SWEET! I feel like on on the ferry, feet kicked up, which the Opera House slide on by! So that is called Circular Quay! Nice name! Thanks! Those are beautiful photos, Alex! Have you taken courses in photography? I am sad to say that most of my shots are set to “Auto” – pretty sad. But I’m taking a course soon. Thanks so much for visiting my blog and commenting! I love your photos of the animals, too! I am self taught in photography and did not attempt any photography courses at all. Thanks for visiting my blog too! Wow! That’s impressive, Alex. Keep up the good work! Thanks! I like them too, I was very amazed when I saw how the lights shine in my picture! great post thanks for sharing. I miss my sister haven’t seen her almost a decade now. Oh….. What is she doing there? You can always make a trip there to visit her! You are a very talented photographer, Alex. How about this …. if you walk along the headland, keeping to the shore, past the Opera House, and into the Botanical Gardens, you could get a shot of the Opera House with the Harbour Bridge behind it. That is what my friend recommended me! Hmmm.. But I’m back in Singapore now. Thanks for your tip anyway! I shall try it once I’m there again! Thanks a lot! Outstanding night shots. They really shine! Thank you very much! I also have to count myself lucky for the good weather! Thank you very much! Feel free to follow my blog for more updates! Cheers! Alex you really have done some wonderful works in your blog. Beautiful pictures. Keep up the good work. It was a pleasure to visit your blog and to see these pictures. Thank you! Feel free to follow my blog! It was a pleasure of mine to have you dropping by my blog too! Stunning photos!!! Love the vivid colours!! Thank you very much for your comment! It is so motivating for me! 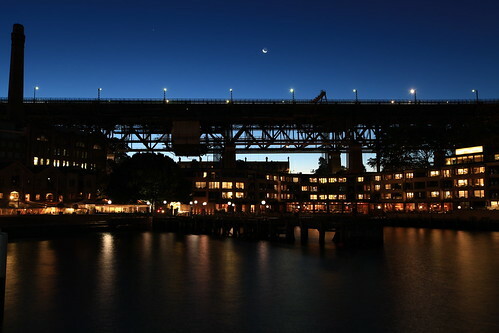 Beautiful night photography… love those deep blues. Thank you! Thanks also for dropping by! I visited Australia back when I was 10, such a beautiful country! Fabulous pictures and great blog. These are amazing Alex 🙂 you are so talented. Every other shot of the Sydney Harbour Bridge I have ever seen shows it at its most delicate. A fine structure it obviously is, but there’s something about your wonderful shot that makes it look so majestic and yet very, very robust. Well done indeed. These beautiful photos make me want to go there! Thank you for sharing! The Opera house is overdone! But this first shot of the bridge is beautiful. Great night shot, perfectly exposed. Let me explain. I don’t mean your shot of the opera house is overdone. I mean that every one takes photos of it. But the bridge seems much more special because it isn’t shot by every one. Oh! That is what you mean! Thanks a lot for explaining! Cheers! i am curently learning photography myself (some posts coming soon from my workshops) so I am glad I found your blog, I like how you explain how you took the photos. What camera do you have? I am using 5D II, in most of my post, I do mention what setup I used for the shots that I shared in the post. Keep reading all my post and you will see what set ups I used. great! i sure will, and hopefully i learn along the way. Yea! Hope you will have more nicer photos coming soon! nice shoot! i like the tone and colour of the night you had captured. Thank you! This was not much edited. Thank you! Do feel free to follow my blog if you like! Your dream will come true! Just keep taking photos! Definitely was worth visiting your blog. These two really caught my eye. Great job. Thanks a lot and also thanks for dropping by! Thank you for stopping by! Feel free to follow if you like! Great results! I love the whole series in Sidney. Thank you! Do follow if you like! Cheers! It looks stunning! Really good night shots! What camera do you use? Thank you! I am using 5D II. It is a great camera in my own opinion! How lovely! A place I dream to visit! Thank you! It is a very nice place to visit indeed! Beautiful shots Alex! Thanks for the like on my blog! Great shots here. The colors in the sky are spectacular! What an amazing angle. Great lighting and composition! You’ve captured magnificent pictures. These are beautiful! Love the blue sky! Thank you~! So nice of you to leave your kind comments here! Thanks! The bridge shot is particularly powerful. Great light and perspective. Wonderful diagonal. Thank you for your nice comment~!! !